Thanks to the social media attention it has received over the last couple of years, one of the hottest summer destinations in Turkey is Lake Salda in Burdur. Nicknamed "Turkey's Maldives," Lake Salda has made a name for itself with its turquoise waters and white sandy beach. Summer might be long gone for now, but the splendid scenery of Lake Salda can still be enjoyed at the new ski center recently opened in Burdur. 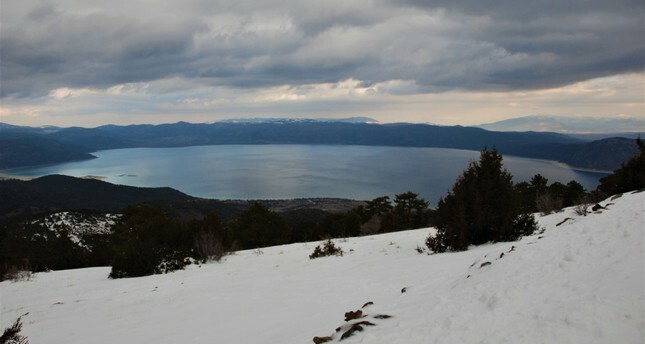 The ski center is located on a hill with a bird's-eye view of Lake Salda, which is popular thanks to its turquoise water and white beach, situated in the pine forests at an altitude of 2,079 meters. It welcomed the season with excellent snowfall across the region. Salda Ski Center, 14 kilometers from Yeşilova, 77 kilometers from Burdur, 136 kilometers from Antalya province and 90 kilometers from Denizli province, offers a peaceful holiday for visitors. Visitors who go to the ski center can enjoy the unique view of Lake Salda and the surrounding forests during their journey. The center presents an economic winter holiday for ski enthusiasts and nature lovers with its easy and hard tracks, chairlifts, ski and sled equipment that can be rented affordably, cafes, restaurants and accommodation facilities that are run by the district's governorship. An amateur skier takes lessons at the Lake Salda Ski Center. Lake Salda Ski Center offers its visitors a nice ski holiday in a small area. The center features three tracks, two cafes and a boutique hotel with 20 beds. However, being a small ski center comes with an opportunity: The prices are much more affordable compared to the more established and popular ski centers around Turkey. Ski equipment can be rented for TL 40 for the whole day and TL 25 for a half day. Sleds cost TL 20 to rent, while an entire meal only runs about TL 15 per person. "The prices are attractive when compared to other ski centers. They are a great opportunity for middle-income citizens. We have also instructors who provide free ski training," said Yeşilova District Governor Abdülhamit Karaca. Lake Salda Ski Center is also popular among ski lovers who do not want to spend the night but still enjoy skiing all day. The center mostly welcomes adventure seekers from Antalya, Denizli, Burdur and İzmir provinces. this year. It also has the lake. Therefore, we can offer beauty to people in both summer and winter," he continued. Association of Turkish Travel Agencies (TÜRSAB) supervision expert Sertan Çevik emphasized that the center is near many popular tourism centers, such as Antalya, Isparta, Denizli and Burdur. Indicating that the center will make a significant economic contribution to Burdur with the increase of supporting structures and facilities, Çevik said: "There are many one-day tours from many local areas, especially from Denizli and Antalya. Apart from this, our agencies designate tour routes, coordinating regions, such as Sagalassos and Pisidia, with each other if we take Salda Ski Center's closeness to other attraction centers into consideration. We hope that tours will continue to increase this year. It is not possible to separate the lake and ski center. We think that the attraction and fame of Lake Salda will spread to the ski center." Lüftü Yılmaz, who came from İzmir with his family to enjoy the center, said they visited on the recommendation of his friends. Yılmaz stressed: "We saw the ski center, which was beyond our expectations. It is a beautiful place. Our hotel is near the lake. We will enjoy skiing during the day and the view of the lake at night." Nupelda Elgönüz, a university student, noted that she liked the center very much. "We see that two miracles are together here; the bird's-eye view of Lake Salda and skiing." National wrestler Asena Şah, who came from Antalya, said that they missed the snow, so she came with her friends to spend the weekend.